Psoriasis, a condition that causes the body to make new skin cells in days rather than weeks, causes thick, scaly patches that often appear on the knees, elbows, lower back, scalp, nails, and joints. Symptoms tend to worsen with age, and psoriasis can be linked to other conditions that affect seniors, including type 2 diabetes, inflammatory bowel disease, and heart disease. Though not contagious, psoriasis is one of the more serious of skin diseases. It often progresses into a chronic condition, and there’s no known cure. Doctors are still unsure what causes an estimated 7.5 million Americans (or 2 percent of the U.S. population) to have psoriasis. Scientists have learned that genes and the immune system may play a role. When a person has psoriasis, for example, T-cells begin to attack the body’s skin cells, causing the body to make new cells more frequently. Once T-cells begin to attack, they continue attacking for the rest of the person’s life. Scientists have also found that psoriasis runs in families. However, it’s not so cut and dry. Some people with psoriasis don’t have the genes that increase their risk of getting psoriasis, and others have the genes that increase their risk but never develop psoriasis. There are eight different types of psoriasis that seniors may develop, each with their own symptoms. 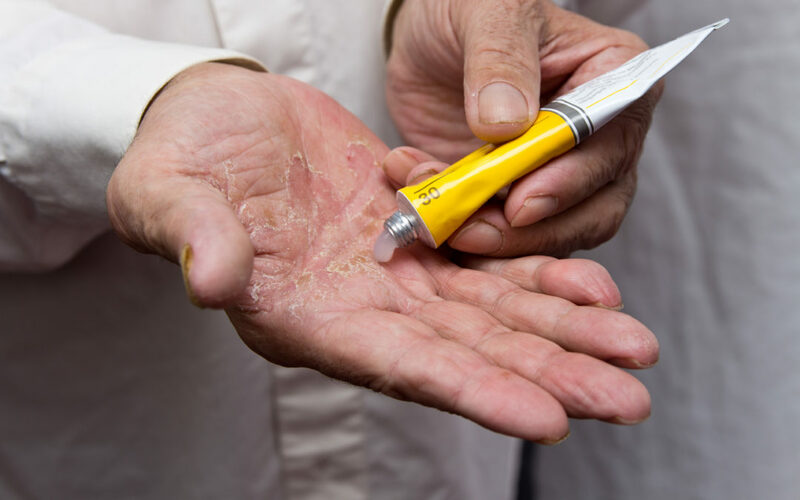 Topical ointments soothe itchy skin but may be demanding among the elderly. Senior patients may need a nurse or loved one to help apply the topical ointment, especially in spots that are hard to reach. Because seniors’ skin is more prone to allergic reactions, practice caution when using topical medications—what works for one person may not work for everyone. Phototherapy/PUVA therapy, a conventional therapy for psoriasis, can be used among the elderly. With this treatment, lasers destroy blood vessels that feed the psoriasis sites, causing them to fade. However, proceed with caution. For some elderly patients who’ve experienced psoriasis for a long time, solar keratosis may develop. This type of therapy can aggravate the symptoms of solar keratosis, so it’s not recommended in these scenarios. Psoriasis medications pose potential complications for elderly patients as they’re often on more than one kind of medication. For any new medication, start with a low dosage of about 5 mg per week in case of side effects. Some conventional medicines, like retinoid, can trigger pruritus, and others like cyclosporine are not recommended for seniors because the side effects are too strong. Finding the right solution differs for each psoriasis sufferer. Some acne treatments, like salicylic acid, may also work, and steroid creams used for cystic acne may also reduce redness and swelling. For more information on senior psoriasis and personalized care provided by Grand Oaks Assisted Living Community, please call us at 202-349-3400 or visit the Care & Services section of our website.